If your teenager has orthodontic concerns, it can be extremely frustrating. The teen years are one of the most challenging times in your child’s life, a time when young adults are searching for their identities and self-esteem. Whether your teen is struggling with too much space that causes unsightly gaps, crowding, an underbite, or an overbite, orthodontic treatment can provide a solution for the problem. Not only will your teenager have a reason to smile, it will mean healthier teeth as well. With the advances in orthodontics, Invisalign Teen could be the right alternative for your teen. When it comes to orthodontics, the first thought that comes to mind is a mouth full of metal. Your teen will be glad to know that metal brackets and wires are not the only treatment option. Invisalign has gained in popularity and has become the treatment method of choice for teens and adults. It’s an effective form of orthodontic correction and the best part is that it’s practically invisible. Your teen’s treatment won’t be noticeable until it’s over and everyone sees the positive results. Invisalign Teen is a form of orthodontic treatment that uses clear aligners made from medical-grade plastic. The aligners are tailored to fit your child’s mouth through the use of advanced imaging. Every two weeks, aligners are changed as your teen’s mouth begins to adapt to treatment. They gently shift your child’s teeth into the proper position. Treatment time generally takes about the same amount of time as traditional methods and the cost is comparable. Teens love Invisalign because you can’t see the aligners. As another benefit, aligners can be removed during sporting events, special functions, and for oral hygiene. Your teen won’t have to deal with abrasive metal that can irritate the cheeks and gums. Your child will be able to take good care of his or her teeth as well, avoiding problems with tooth decay during treatment. Invisalign aligners should be worn for at least 22 hours a day to be most effective. It’s important to avoid drinks with dyes that could stain aligners. When performing oral hygiene, your teen can clean the aligners as well to keep them fresh. Contact Papandreas Orthodontics to begin your teen’s journey to a healthy, attractive set of teeth, a gift that will last a lifetime. When you set up a consultation, your teenager will have a thorough evaluation. You will be able to discuss the possibility of Invisalign Teen treatment for your child. Ask questions and get all of the details so that you can move forward. When your child has straight teeth that are aligned properly, it can open the doors to confidence and oral health. 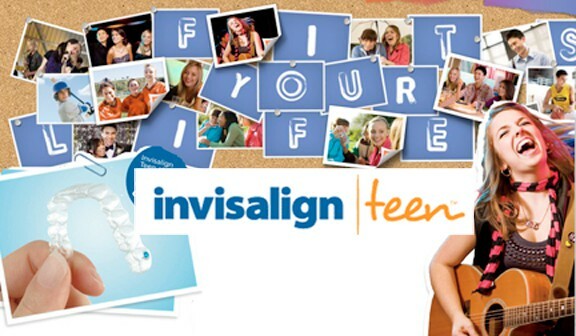 Make your appointment today to discover how Invisalign Teen can change your teen’s life.